Fullwoodhead Dairy Supplies Ltd is the Master DeLaval dealer supplying milking equipment, milk cooling and refrigeration equipment, dairy supplies, dairy service and sales throughout Aberdeenshire, Angus, Ayrshire, Banffshire, Bute, Caithness, Clackmannanshire, Dunbartonshire, East Lothian, Fife, Inverness-shire, Kincardineshire, Kinross-shire, Lanarkshire, Mid Lothian, Moray, Nairnshire, Orkney, Perthshire, Renfrewshire, Ross and Cromarty, Shetland, Stirlingshire, Sutherland and West Lothian. We are also the Holm & Laue Dealer for Scotland and Cumbria. We service and repair all makes of milking equipment, bulk milk tanks, refrigeration units and electrical installations. Our service packages are tailored to meet the individual needs of your farm. Fullwoodhead Dairy Supplies Ltd, is today the Master dealer of Delaval milking equipment for the West coast, Central and Northern Scotand. With 3 depots and a high calibre of sales staff and engineers, we provide an efficient service. The founder Alex Wilson, who was born at Fullwoodhead Farm, Gateside, left school and went to work for Fullwood, installing parlours, he worked his way up to area manager selling Fullwood parts and parlours but with the arrival of his first son Brian he had wanted to stop travelling away from home as much, so on the 1st September 1981 Alex Wilson with the help of his wife Mareth, opened the doors of his small shop and workshop, in an industrial unit in Paddockholm, Kilbirnie. There he sold, repaired, maintained Fullwood parlours and supplied chemicals and sundries. The company grew steadily and soon had to move to a bigger unit in Paddockholm and by 1995 new premises at Mossend, Lochwinnoch were acquired, where the head office is still located. Sadly, in 1996 Alex suddenly passed away, leaving Mareth and Brian, who had just left school, to run the business. In 2000 the opportunity arose to take over a compeitor, Jimmy Miller, who was a DeLaval dealer and this paved the way for Fullwoodhead Dairy Supplies becoming a DeLaval agent, from then on the company, supplied and installed DeLaval parlours and chemicals, always with the customers satisfaction at the fore front. Also in 2000 the company won The Scottish Dairy Industry Awards for service to the dairy sector. In 2004 the company took over Chamber Bros premises at Ayr Cattle Market and with that came the DeLaval Dealership for Ayrshire. Brian's youngest brother Scott also came to work for the company in 2004 and is now a qualified electrician. 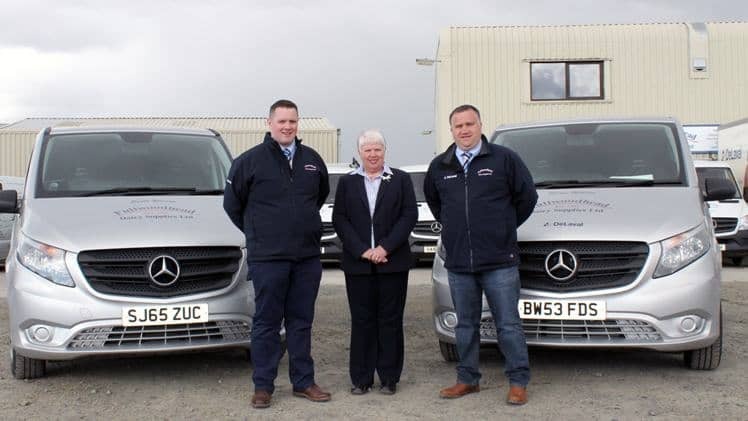 In 2015 Fullwoodhead Dairy Supplies Ltd, took on the Dairy side of Filpumps business, based at Inverurie, expanding the area all the way up to Shetland. With an office based at Kinellar, where the sales vans and engineers are based. To date the company employs 22 people and still maintains the same ethos that Alex started the company with, providing a high quality service and products to customers.